Idea Factory Educational Services (IFES), founded by Nicole Grimm, a former employment relations major at SIUE, won the $6,000 second place prize. The mother-daughter team of Emma and Robyn Starkey grabbed the $4,000 third place award for Harvest Market. Partners Joshua Colclasure and Sammie Williams founded Pint Perfect, which plans to offer both draft line servicing and bar cleaning to local bars and restaurants to provide a cleaner and safer beer drinking experience to the St. Louis metropolitan area. The duo’s passion and drive, along with their experience in brewing and draft beers, helped them stand out among the competitors. The cash award will enable the pair to invest in the equipment needed to get their business up and running. With IFES, Grimm hopes to use her teaching background to provide language education services to children and behavior management techniques for parents in early childhood centers in St Clair County. The Starkeys hope to expand Harvest Market’s Saturday and Sunday farmers market in Columbia into a year-round attraction for residents of Monroe County and southern St. Louis. They also plan to expand into a local grocer, small deli and eventual community commercial kitchen. 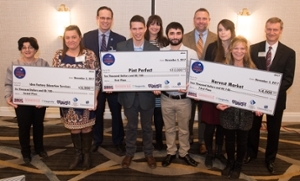 The top three teams presented their winning business concepts at the Leadership Council Southwestern Illinois Board of Directors meeting Friday morning before a live audience of Leadership Council members and invited guests. The member-based organization includes more than 200 leaders in business, industry, education, government and labor. Jo Ann DiMaggio May, Illinois Metro East Small Business Development Center (SBDC) at SIUE director and MESC co-organizer, along with SBDC graduate students Adrinè Krikorian and Chelsea Mettler are excited about the amount of participation and hard-work applicants put into their business ideas and presentations and hope to see continuous community involvement next year. “I am humbly impressed by the large number of superior quality concepts brought forth by the participants,” said May. “It made our evaluation process and final decision on awarding the prize money extremely difficult. The three winners will also receive in-kind support from the attorneys at Mathis, Marifian and Richter, accounting services from Scheffel Boyle along with human resources services from Insperity HR Outsourcing Services to help them form their businesses and manage their start-up expenses. For the fourth straight year, the SBDC at SIUE, along with strong support from various business and economic development partners, spearheaded the MESC. The SBDC organized a group of business mentors and startup advisors to assist the 15 MESC semi-finalists with their business plans. For the fourth consecutive year, Leadership Council Southwestern Illinois, SIUE School of Business and University Park at SIUE were the Startup Challenge’s cornerstone sponsors. Insperity HR Outsourcing Services and the City of Collinsville were this year’s premier sponsors. Other sponsors included Woodforest National Bank, Anders CPA, FCB Banks, the City of Edwardsville, Commerce Bank, Curtis C. Bailey, the Riverbend Growth Association and Artigem. The Illinois Metro East SBDC organized and managed the competition with the support of the SIUE School of Business. Photo (L-R): Front Row: Illinois Metro East SBDC Director Jo Ann DiMaggio May, Idea Factory Educational Services founder by Nicole Grimm, Pint Perfect Partners Joshua Colclasure and Sammie Williams, Emma and Robyn Starkey of Harvest Market, SIUE School of Business Dean Tim Schoenecker. Back Row: Chris Kirk of First Mid-Illinois Bank & Trust, Susan Morse of Insperity and Collinsville City Manager Mitch Bair.